The history of coffee in Iceland dates back to November 16th 1703, when Árni Magnússon – a scholar and collector of many highly valuable Nordic manuscripts – acquired a quarter of a pound of coffee from a friend. To begin with, coffee was rare and only enjoyed at the episcopal see Skálholt (one of two historical bishop seats in Iceland). Icelanders didn’t begin roasting coffee until the mid-18th century; before that, the people at Skálholt made a porridge from the unroasted beans. By around 1760, green coffee had become a common product: practically every home had their own roaster and grinder, and by 1850, coffee had become an inseparable part of the working day. It was consumed at least twice or three times a day (even more often while sailing or during harvest season). 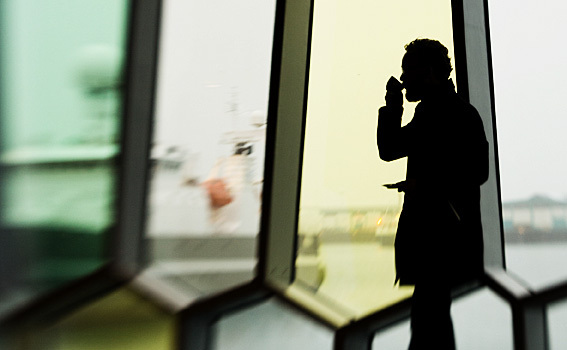 By the end of the 19th century coffee was thoroughly intertwined with Icelandic culture, much like it is today. This article will focus primarily on the coffee culture from that timeframe, the mid-19th century and throughout the early 20th century, arguably the golden age of home roasting in Iceland. 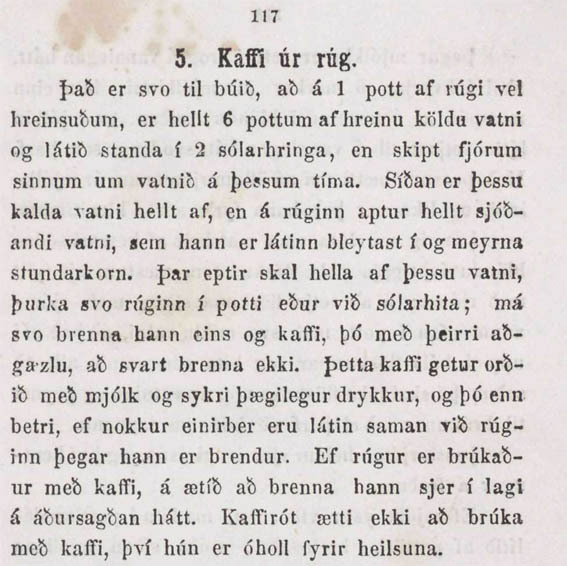 The original purpose of coffee in Icelandic homes was treating visitors – especially the clergy – with due hospitality; gradually people started drinking coffee on Sundays and other holidays until it, by the mid-19th century, had become a daily habit. Icelandic hospitality is crystallized (and partly parodied) in a character called Hnallþóra, in Nobel laureate Halldór Laxness’ novel Under the Glacier. Her view of hospitality involved lots of cake (her name eventually became a synonym in the Icelandic language for large layer cakes). This was Hnallþóra’s way to compensate for her coffee skills: she made undrinkable coffee. She represents the stereotype of the Icelandic housewife: strong, hardworking, big-hearted, and makes way too much food, leaving leftovers for days after –creating a vicious cycle. As mentioned in another article on Nordic Coffee Culture, Tíu dropar (meaning “ten drops”) is a common reply from a visitor running door-to-door errands (e.g. the postman, priest, even political candidates, etc.) – typically out in the country where the next farm over might be in a different fjord. That way one respects the hosts obligation without overdosing on coffee at the end of the day. It was common to add dried chicory root in the ground coffee; it was generally called kaffibætir, Ludvig David (the name of the producer) and export. 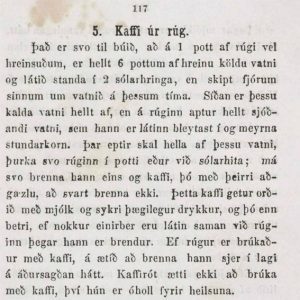 Icelanders got used to the bitter taste up to the point of it becoming an essential part of the coffee experience, with Icelanders mentioning the chicory root in rhymes. Important to know is that rhymes are the original mnemonics in Icelandic culture, from before anyone could write; putting together rhymes remains a form of entertainment in local newspapers and magazines in Iceland. That said, coffee was pretty fresh. It was imported in its raw, green form and every home would have a pot to place over a fire for roasting the coffee. Roasting coffee was generally viewed as a craft that was hard to master: Icelanders had strong opinions how the color should be, not to mention evenness of roast. Scorched, burnt beans, or coffee where you’d detect a raw spot was considered undrinkable. You could typically roast a batch to last a family for several days, depending on the size of the roasting pot; each batch could be between a few hundred grams up to a kilo. Some roasters would add butter to the roast to get a shiny surface on the coffee beans. Home roasting ceased in Iceland gradually after the advent of industrial roasters. Some sources say it happened between 1950-60, others say sooner. Although Icelanders were to some extent influenced by the Norwegian kokekaffe (Icelandic: ketilkaffi), brewing with a cloth filter (most often made from flannel) was the most popular brewing method. However, brewing the Norwegian way for a lot of people was easier, especially during harvesting or gathering livestock for the winter. 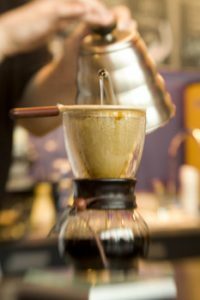 There are a few examples of some creative ways to let the coffee grounds sink to the bottom faster, a problem that all kokekaffe makers are aware of. A splash of cold water after steeping would normally do the trick but others would put a wooden piece in the kettle or even the skin of dried fish. Some examples of superstitions related to coffee are quite interesting. In early 20th century, if you drank your coffee with milk or cream and sugar, you had to put the sugar before the cream; if you had done it the other way around you wouldn’t get married for at least seven years! Drinking the coffee piping hot made you ugly, whereas when enjoyed at a colder temperature it made you pretty. Sediment left in the cup after drinking was a good omen. Accidentally serving guests coffee in an unmatched cup and saucer (called þrælapar in Icelandic or “slave couple”) means the guest will have an affair or remarry; if you refill the cup before you’ve finished from it the first time you’ll get a bad mother-in-law. Some habits still make sense. It was considered rude – and still is in my opinion – to fill the cup to the rim. It was also common to see coffee drinkers pour a little bit of black coffee from the cup on to the saucer to let it cool faster. An open letter was published on the daily paper Tíminn in 1969. It was from an Icelander living in the USA, complaining about the lack of coffee culture in America. The coffee doesn’t taste as good via regular pour over, he claimed, so he’s forced to switch to the percolator. Cloth filters and coffee pots with a narrow spouts are unheard of, and what is even worse: Americans drink their coffee any time of the day, i.e. they’re not familiar with the concept of kaffitími (the Icelandic equivalent of the Swedish fika). Although he had gotten used to the taste of American coffee, he sometimes visits his old brewer, sitting alone gathering up dust on his shelf. When he returns it to its perch, the brewer sighs, as if missing the good old days. This entry was posted in Coffee, History. Bookmark the permalink.